HBO's Banksy Does New York opens with a scene of two men attempting to remove a giant Banksy! balloon from its perch atop a building in Long Island City. Scaling the facade with a ladder, they retrieve their prize, but are immediately tackled to the ground upon climbing down by several men in a growing throng. A fight breaks out, the cops show up, and the final artwork from Banksy's "New York residency" is hauled off in a paddywagon. Believe it or not, it is exactly what the artist wanted. The documentary follows the street artist's dramatic, enthralling 31-day stint in New York City. For those who don't remember, beginning on October 1, 2013, he produced a new artwork each day, leaving clues as to its whereabouts on his website. A cultish following that identified themselves as "Banksy hunters" quickly sprang up. Some of these followers were reporters chasing the story, but most of them were just everyday people who for whatever reason were so taken with Banksy's work, they decided to drop everything and spend a month obsessively tracking and documenting his actions. Much of the film is comprised of video and photographs taken by these people. Despite what graffiti writers who view him as a sellout would have you believe, Banksy is nothing if not an artist of the people. His work widely appeals to the public, and it also plays with the community in subtle (and sometimes not-so-subtle) ways. Watching the entire month-long residency unfold in about an hour's time, it becomes clear that the stencils left on buildings were just the beginning of what he intended to create. Critics who have quickly dismissed his work as unsophisticated and obvious are only looking at its most basic elements and ignoring the whole picture— it's evident that the anonymous artist carefully manipulates the frenzy around his work. 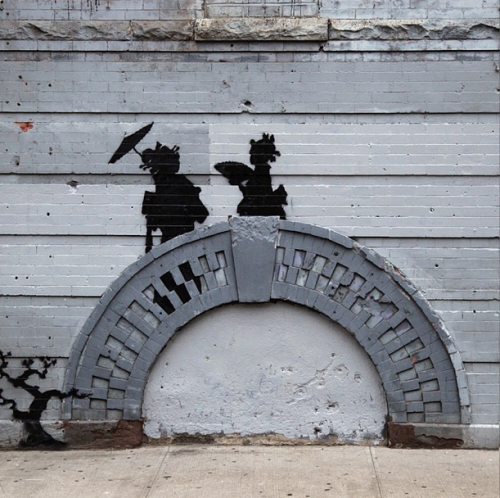 This world of Banksy functions a bit like a fairy tale. A modern-day King Midas, everything he touches turns to gold. He has the ability to greatly help people simply by showing up and signing his name on something. It's an incredible kind of power, and inevitably, it causes both heroes and villains to crop up around him. Obvious heroes are people like the "Wet Wipe Gang"—a ragtag group of unofficial art restorers who would clean up the paintings after a vandalism like the one that occurred on his traditional Japanese footbridge in Bushwick. The undisputed villain of the film seems to be gallerist Stephan Keszler, who buys stolen Banksy works, hauls them off to his annex in the Hamptons, and attempts to resell them at a major markup (I say "attempts" because all of his works from the New York residency have yet to sell). But there are grey areas as well. One of the pieces purchased by Keszler is a stone sphinx sculpture from Willetts Point, Queens. The neighborhood is home to over 250 small businesses that received word just weeks before that the area would soon be demolished to make way for high-rise condos. Autobody shop owner Bernardo Veles saw a golden opportunity, and with the help of friends, packed up the sphinx into the back of a truck and then proceeded to store it in his grandmother's garage. Veles' status as a "good guy" or a "bad guy" in the world of Banksy remains uncertain. Sure, he stole the artwork, but he also probably needed the money to continue to exist in a New York, whose cost of living has risen exponentially. Setting up these kind of tenuous situations and exposing the deeper issues beneath them is exactly what Banksy's art (and this film) do best. During the Banksy! balloon fiasco, the film cuts to an interview with a Banksy hunter who says she wishes she could explain to the cops the "cultural currency" of what they're shoving into the back of their van. Any understanding of that could be immediately remedied by watching this film and reliving this art-based social experiment that touches the lives of people as diverse as New York itself.